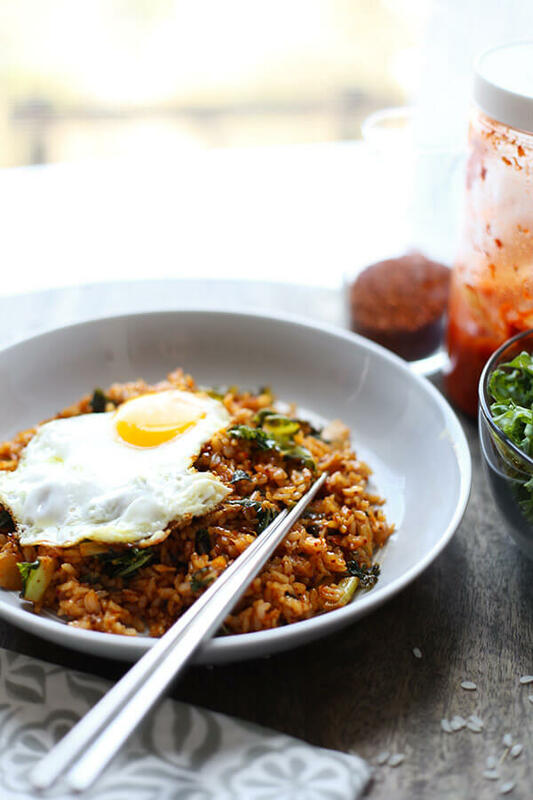 Whip up this quick & easy kimchi fried rice in less than 15 minutes! The kale adds a boost of nutrients to this already healthy & scrumptious recipe! Last Friday I invited a couple of friends over to test the new hot plate I had recently bought. 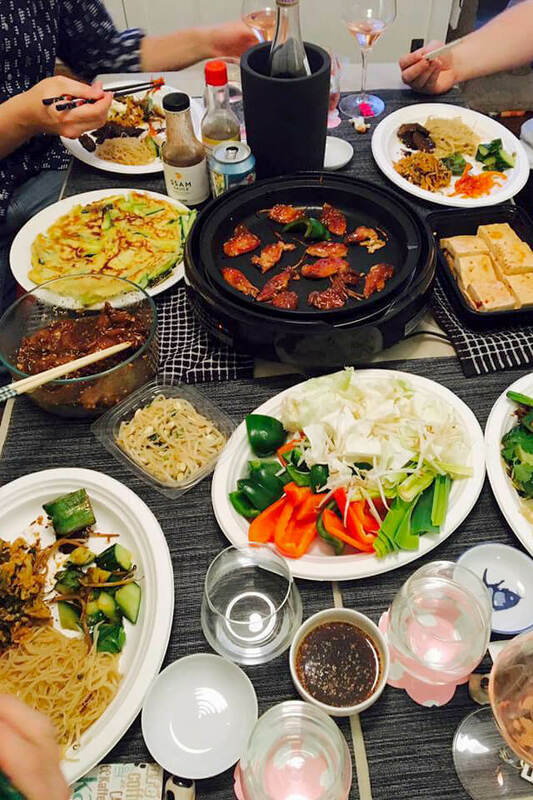 I threw a Korean barbecue themed dinner with tofu, beef and chicken bulgogi, and lots of chopped veggies to grill and enjoy with a variety of dipping sauces. I also went all out on side dishes; squash pancakes, stir fried noodles, pickled cucumber salad and a fiery red kimchi fried rice. The table was filled to the gills with food and drinks and we stayed up until 2:30 eating, laughing and listening to music. It was the most perfect and fun evening! Hosting dinners is one of my favorite things to do – I love the entire process of picking a theme, creating a menu, buying wine, decorating the table and choosing the music. I love to entertain at home and one of the greatest things about living in a place like Brooklyn is everyone is always happy to come visit. 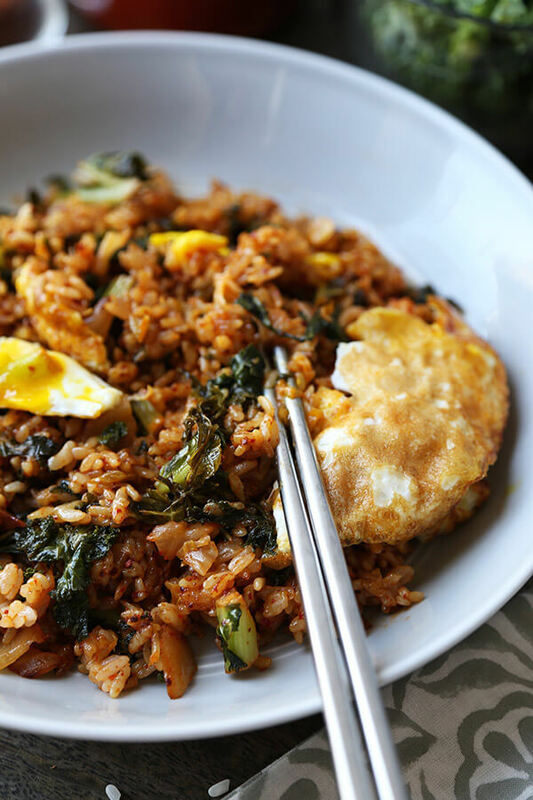 I picked this kimchi fried rice recipe as a side that evening because it’s very easy to make. I was so swamped with having to make several dishes that I stuck with recipes I knew were quick and sure winners. 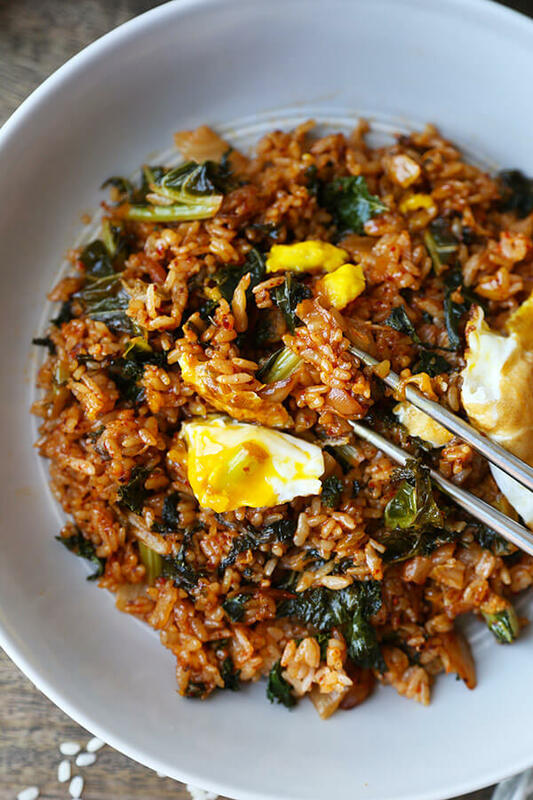 This kimchi fried rice is smoky, spicy, sour, filled with umami and has the perfect amount of chewiness required to make you go mmmmm! Ben and I were happy to have leftovers from that dinner – fried rice keeps extremely well and is a good hangover food. 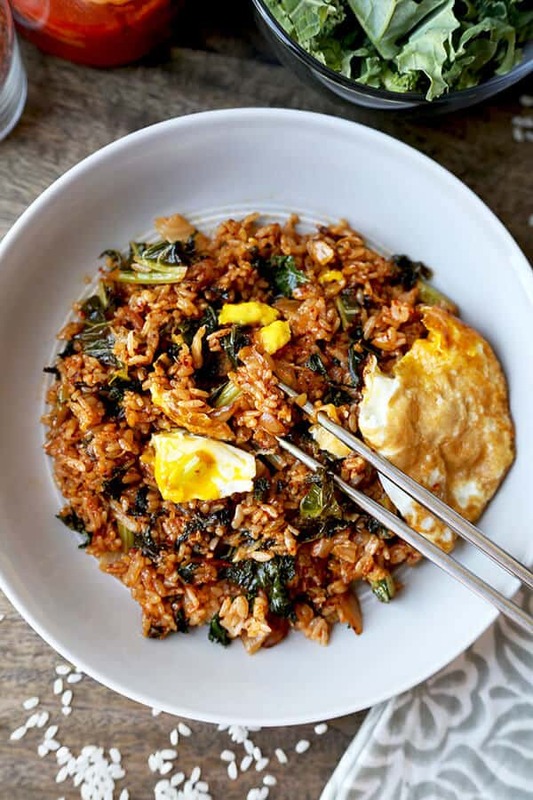 This kimchi fried rice recipe can be made with brown rice, farro or wheatberries and the kale can be swapped for swiss chard. Just like most fried rice, many of the ingredients in this recipe can be swapped for others. As long as you have kimchi, soy sauce, rice vinegar and some sort of cooked grain, you can make this recipe. 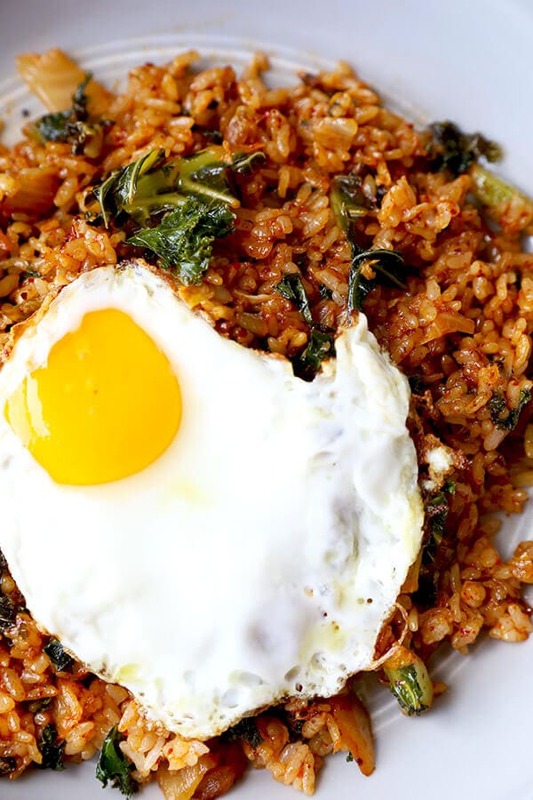 We love to top our kimchi fried rice with a fried egg but that’s also optional. The runny center adds richness to the rice and marries wonderfully with all the other flavors (it tastes more indulgent). 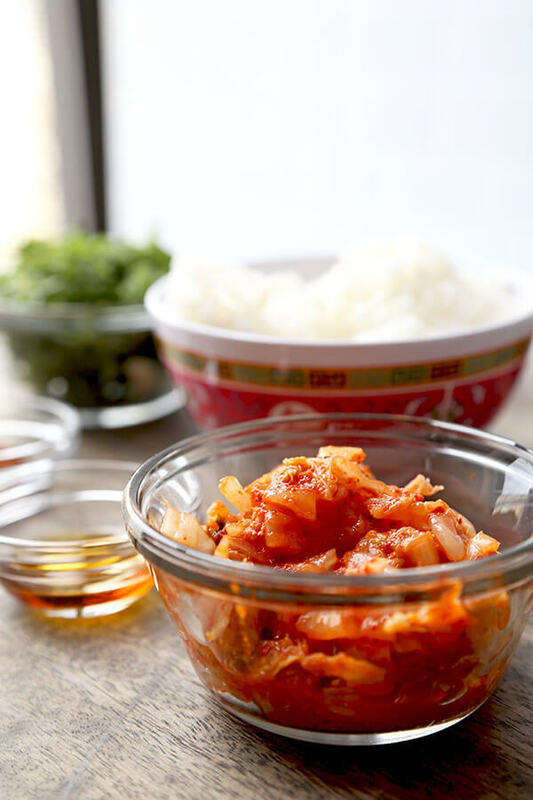 If you are a kimchi lover like we are, you are going to love this recipe! I recommend over cooking the rice that sits at the bottom of the pan so you get a nice crispy texture – just like that of rice cooked in clay pots. 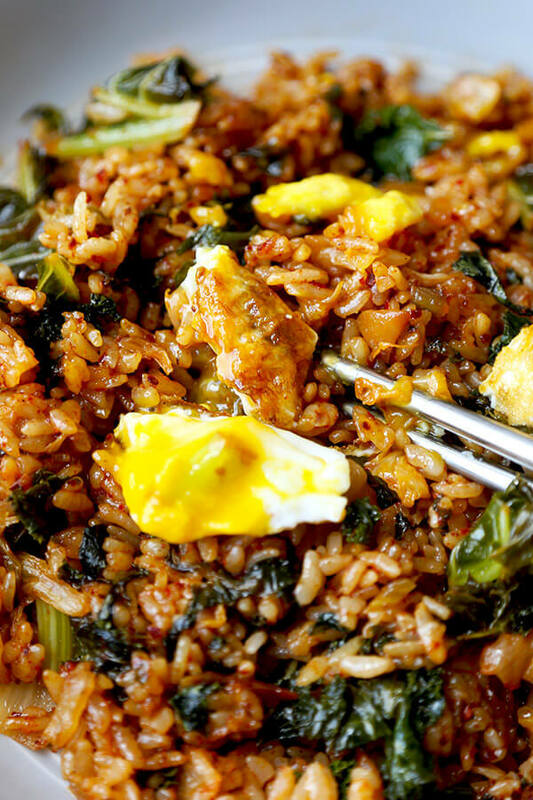 This kimchi fried rice recipe will keep refrigerate for up to a week. 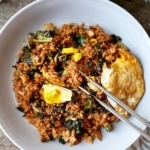 Did you like this Kimchi Fried Rice Recipe? Are there changes you made that you would like to share? 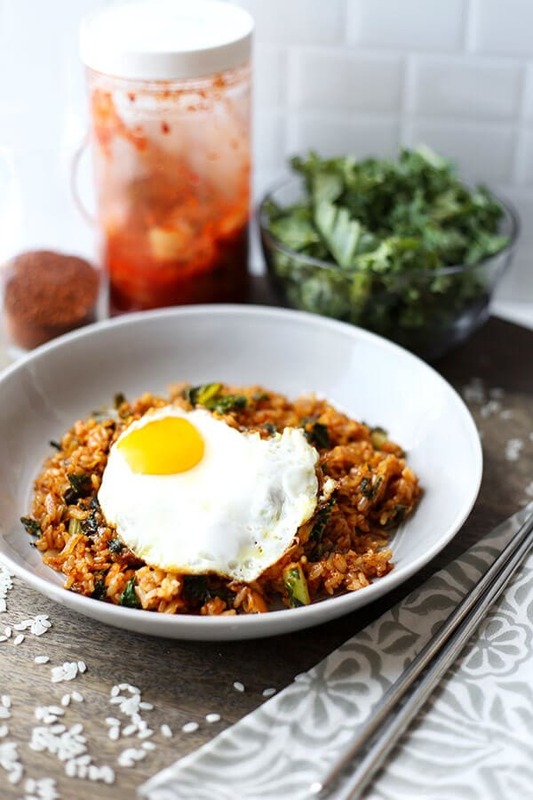 Spicy, pungent kimchi fried rice topped with a fried egg. Delicious! In a pan over medium high heat, add oil and when the oil is hot, add kimchi. 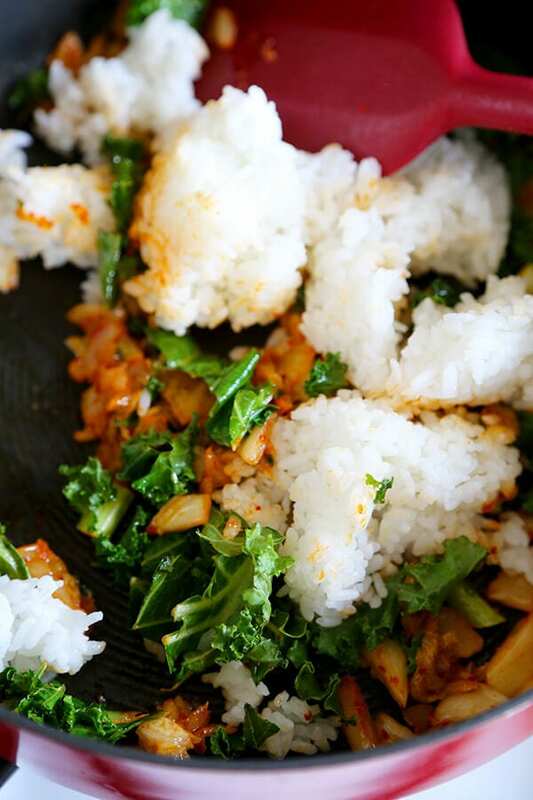 Cook for 3 minutes until kimchi is soft and add kale, rice and water. Toss, cover and cook for 2-3 minutes, until kale has soften. Stir in soy sauce, rice vinegar, Korean pepper flakes, sesame oil and cook for 2 minutes. Transfer to a bowl and serve topped with a fried egg. 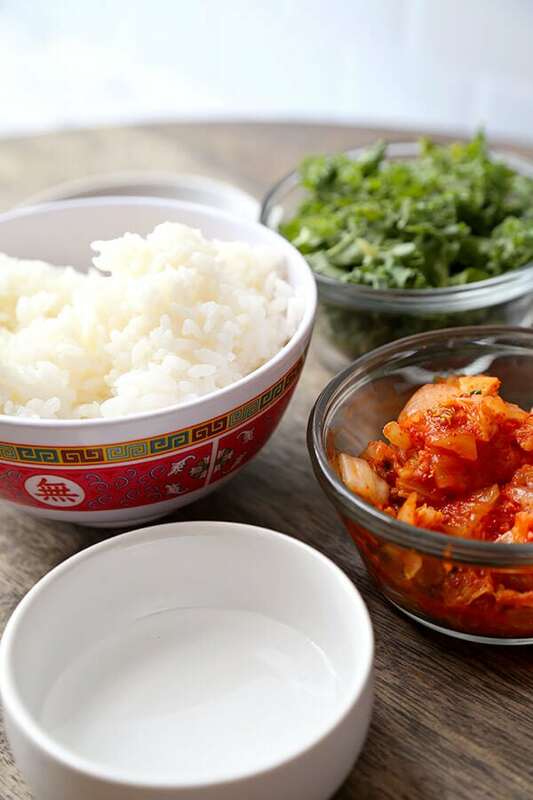 Do you use homemade Kimchi, or is this store bought, and if so, any brand or type you recommend? My recommendation is to buy it at an Asian grocery store since they tend to sell bland ones at popular grocery chains. Try squeezing the juice out of the kim-chi, adding the soy sauce to it and some fish sauce, use that in place of water after you’ve fried it up a bit – I think it makes for a deeper flavor.